The Nacon brand is now renowned for its development of PC accessories and has now evolved to producing high performance and premium quality console products dedicated for eSports. 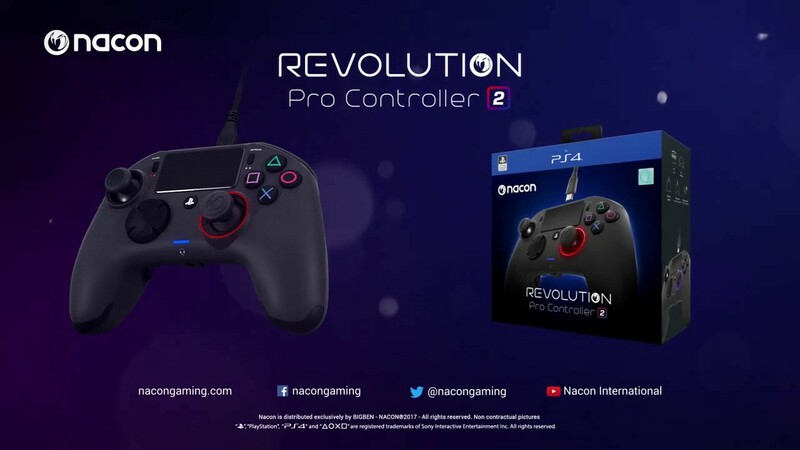 The REVOLUTION Pro Controller 2 is the result of the hardwork of Nacon engineers, developers and designers coupled with the feedback from professional gamers and the gaming community and in association with Sony Interactive Entertainment Europe. Bring eSport in your hands on Playstation ® 4 and PC! providing the best accuracy on the market. Shortcut buttons on the back of the controller can be set manually! thanks to its Advanced mode. The improved interface has been redesigned with a more ergonomic layout and allows the player to save up to 4 profiles on the controller with more advanced settings. The controller also features a newly added response curve, for the left joystick, and enhanced D-Pad modes alongside the original trigger reactivity and button mapping options. Each player will be able to configure the REVOLUTION Pro Controller 2 to optimal settings according to their preferences and type of game.